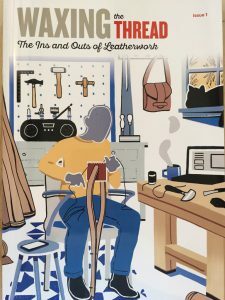 A UK magazine for leatherworkers… at last! Published here at GDH in West Wales, ‘Waxing the Thread’ is a 36 page A4 print magazine for hobbyists and all who are interested in traditional leatherwork. With a limited range of books available for the traditional leatherworker – and no UK leatherwork magazine that we know of – we set to and created a magazine for leatherwork hobbyists. Modern yet traditional, ‘Waxing the Thread’ aims to assist hobbyists and introduce newcomers into the craft. Issue 1 starts as you might expect, at the beginning, with Project 1 being the most basic level of entry. This project is achievable for complete novices as well as those who’d like a ‘reminder’ of the order of things. Pop the magazine on your workbench and follow the full step-by-step guide, which will hand-hold you right through the project. 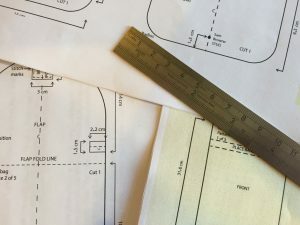 We’ve also included an essential step-by-step introduction to pattern making, plus a secondary project which will help readers reinforce their new pattern making and basic leatherwork skills. Flip through to the Pattern Pages; the beauty of these is that you can work directly from them if you’ve already been leather-working for a while and would prefer not to go back to basics. The first of the Pattern Pages includes a scaled down pattern which is tremendously easy to recreate now that you have those pattern making skills under your belt! The same step-by-step making guide can be used as for project 1, plus we’ve given you some extra help with fitting the additional pattern piece. Project 2 will increase your skill level further as you’ll be fitting a gusset and a piece of hardware too. A bit trickier than Project 1 – we didn’t want you getting bored! Again, the scaled down pattern is there for you and by the end of this project, you’ll be recreating the patterns with confidence. This is another step-by-step guide, so nice and easy and also a bit of a treat for those who like the idea of working from a copied pattern – just making, without the maths! Building on Project 2 is another of our Pattern Pages: If you’ve worked right through the magazine, this will be the fifth leather item you’ve made increasingly developing your skills along the way. Making this final item will see you planning the order of construction while still making use of the Project 2 making guide. All the Project and Pattern Pages inform you of the materials (and leather thicknesses) that we used, so you’ll be able to plan ahead with ordering in supplies. Of course, there’s more to leatherwork than just leather, so we’ve paid homage to some of the other workshop materials used and hopefully, in doing so, have enlightened you with regard to those linen thread numbers! There’s also information about beeswax, an article to help with design, and How-To pages to assist with tasks such as tool sharpening and additional pattern making techniques. You’ll also find out who we interviewed, which leatherwork book was selected for review and why we took a trip to St Fagans National Museum of History. Then there are the ‘Readers Pages’ which we hope you’ll get involved with for future issues and finally, the ‘Just For Fun’ page… there’s a competition here! Overall, we like to think we’ve created a leatherwork magazine with ‘something for everyone’. We hope you’ll like it as much as we enjoyed creating it! Buy Issue 1 of ‘Waxing the Thread’, leatherwork magazine.